I have finally completed a quilt for the son of very close friends. His sister has had one for two years, and I felt bad for not making something for him, too. He plays soccer and baseball, hence the sports theme of this quilt. Sewing for older boys can be tricky. My goal is to make something that is interesting but not too pretty. This quilt measures approximately 65 x 84. Just for fun, here is the one I made for his sister. I love this pattern, the Giant Vintage Star Quilt Tutorial, from In Color Order . Simple to make, with striking results. Approx. 64 x 64. 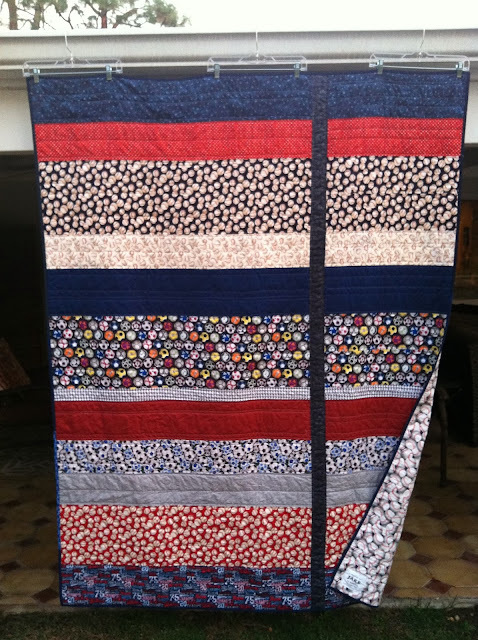 I used the same tutorial to make the Smith College quilt that I blogged about previously.